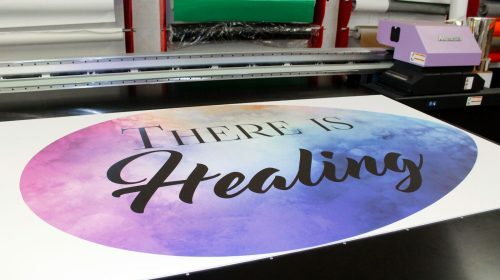 Foamboard or fomecore signs come with personalized full color flair and in any custom size and shape. These foam signs are used for photographic prints or directional signage, POP displays and even autograph boards. Foam board signs is a cost-effective and highly versatile advertising tool. It is made of a light foam core and a rigid cardboard coating. Individuals, Business owners and marketers highly benefit from this low-cost yet durable and high-tech looking material. 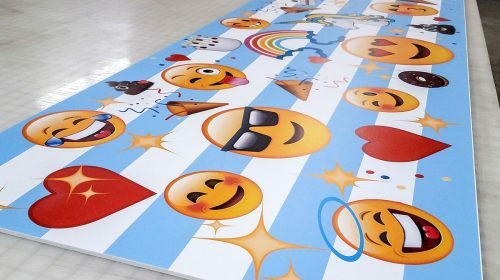 Although it is not recommended for outdoor usage, its smooth surface is ideal for printing projects – can be found as interior decoration, poster, drawing, wall cluster, gallery art and many more! It can easily be bent, cut and shaped to meet any tricky requirement. Note: The material is not designed to be waterproof, thus avoid inclement weather conditions while used outdoors. 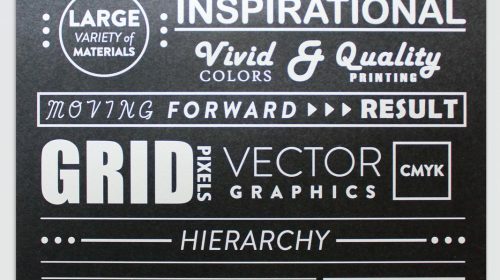 We digitally print using UV fade resistant inks, which stay vibrant and preserve its color density and vividness after many years of exposure. 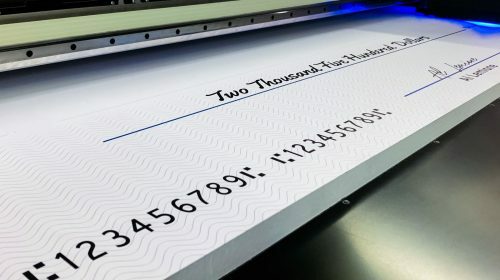 One or double-sided printing options are available. It’s great for hanging from a ceiling: you can use it during your presentations where you can flip the sign for extra visual aid. Your artwork will arrive with pre-drilled holes or a hanging mechanism, so you don’t have to worry of how to secure it in place. 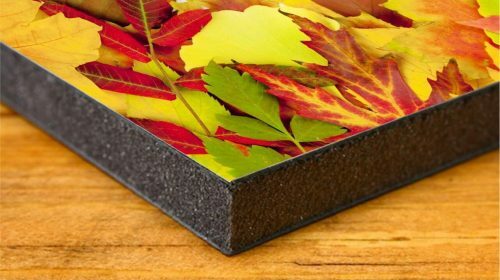 Your foam core display with an eye-pleasing imagery and is the most economical way to showcase any message – a special memory, scenery, gallery exhibits or a product line. 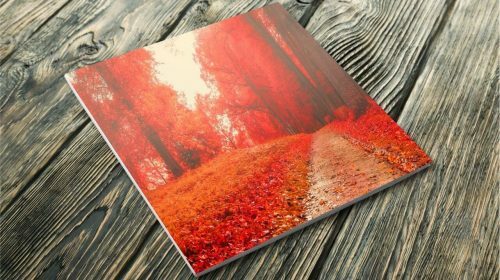 The surface of the Foamboard is ideal for printing, mounting photos, artwork prints and all creatives. It's lighter and costs less than Gatorbaord, and therefore is the ideal choice for short and mid-term uses. 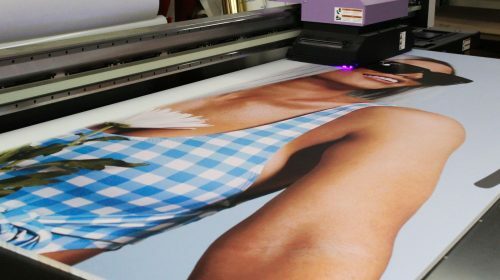 Very often Foam Board prints are used as indoor posters, exhibition boards or indoor displays with different messaging. Furthermore, is ideal choice to create Gallery captions, hanging promotional signs. Shops, hotels, science and industrial fais, and even individuals can have custom prints with the guaranteed quality finish. 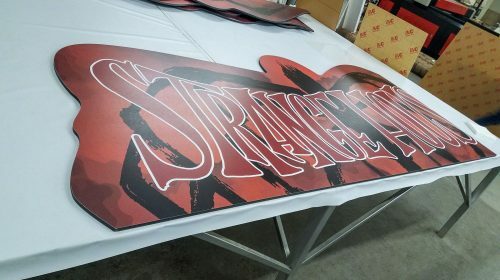 Apart from mounting options, foamboard, lightweight yet flat and enough rigid, can be used as a standee cut outs, or a photocall at special events and holidays. Moreover, can be cut and used as a 3D structures, multiple displays, architectural models of building and fabrications. Foamboard signage, last but not least, is very popular artwork during trade shows in the form of directional, promotional aor functional signage, for example “come to our Booth”, “Last offer”, Menu listing, etc. We directly print on this material using the latest digital printer and UV quality inks. The Graphics are cured with UV rays, which make the artwork sun and fade resistant. 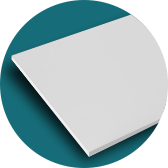 One sided and double sided printing options are available, as both sides have printable surface. Thickness: 0.125", 0.188", 0.5", 1"
The installation option depends on the purpose of the sign, but generally its hung, mounted or freestanding. There are different installation accessories. Our top recommended options are: standoffs(excellent way to showcase the artwork in full dimension), command strips or a Easel back. Gator Board Signs can be used for various purposes, be it personal or business applications. For decorative purposes, you can get your desired image printed on Gatorboard and decorate any interior with it. You can create beautiful wall clusters with your family photos or just display a collage of a breathtaking scenery in your office. As for the business purpose, Gator Board Signs can promote the name and the logo of your company in your office or elsewhere. Moreover, Gatorboard prints can be used as wayfinding signs in hotels, hospitals, lobbies, etc. 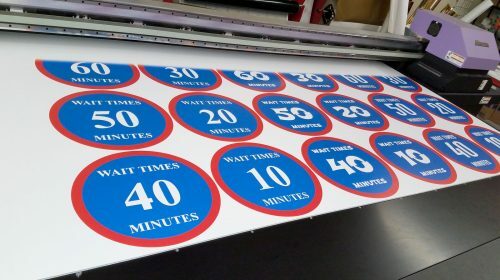 Gatorboard Signs can be used to provide information about working days and hours. These Signs can be used for promotional campaigns as well. Let your customers know about seasonal discounts or any other announcements. 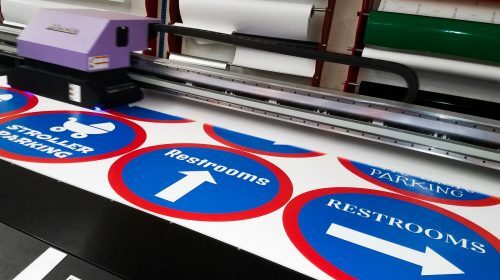 For printing on Gator Board Signs, we use UV curing printers. After the printing process the inks are dried with ultraviolet rays, which make the inks sun and fade resistant. You can get any image printed on Gatorboard, the long lifespan of the vivid colors of the printing are guaranteed. Double-sided printing for Gatorboard is also available. Gatorboard is a cost-effective and affordable sign-to-have for small and medium businesses. 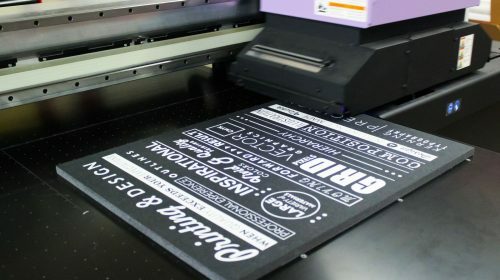 Gatorboard prints usually come with matte finish and are used for menu boards, conference and event displays, tradeshows and even job and craft fair exhibitions. Can be ideal choice for promotional and kiosk displays. 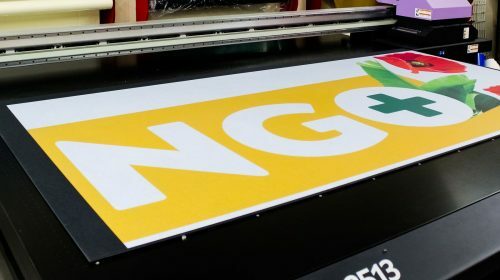 Yes, our digital cutting machine allows us give different shapes to any material - let it be gatorboard, PVC, foamboard, etc. This means that you are free to design any type of sign for your business or personal use. Not recommended. 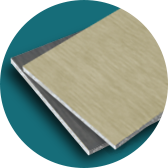 Gatorboard is a durable material meant for long-term indoor usages yet harsh weather conditions and sun rays may be harmful for it when used outdoors. Though short term applications in good weather conditions will not harm the display. Anyway for longer usages and better look of your sign - keep gatorboard for interior promotions and decorations. 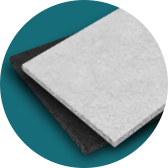 The default colors of our foam board material are white and black. This means that the parts without any graphics will remain with the default color of the material - so choose the one which you think will best showcase your design and mood. Also mind that the sides of the sign may remain unpainted, so take that fact into consideration too. 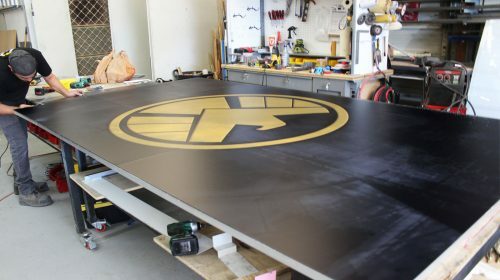 Here are some tips that will help you keep your foam board sign in the ideal condition: Keep the sign environment at 68°F – 75°F (20°C – 24°C) Keep the sign at a relative humidity between 45-50%. Store or put it on flat surfaces. Try to keep the foam board away from exterior doors and windows for stable temperature.